Something about Meet the Robinsons feels very old-fashioned. This is a good and bad thing. It's a good thing in that the movie's humor is a throwback to older cartoons; it's a bit on the loony and wacky side. It's a bad thing in that the story is overly familiar and a bit too predictable - most people will be able to guess one of the very large reveals once the story starts moving. The standard themes of family and friendship are also present. 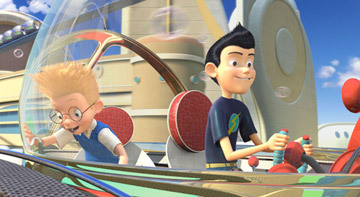 But there is a spirit and energy to Meet the Robinsons that is absent from most children's films, computer animated, traditionally animated, or otherwise. Many people are looking at this film closely, as it is the first film released from Disney since Pixar's John Lasseter was given creative control over all feature animation (it happened partway through production of this movie). The results are mixed. The animation is a step up from Chicken Little, but still lacking behind Pixar, the standard-bearer for computer animation. The figures are a bit cartoony, the bright visuals to do contribute to a nice, colorful vision of the future, where people zip around in bubbles and live with all sorts of bizarre inventions. The future of this movie looks like the futures of older movies, not like the bleaker futures envisioned in today's films or cartoons. 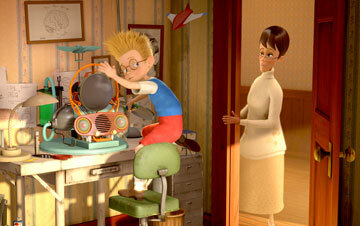 Meet the Robinsons is based on the book A Day with Wilbur Robinson by William Joyce (uh, no spoiler there). It was adapted by Jon Berstein (Beautiful, Ringmaster) and with a whole slew of others assisting, and directed by Stephen Anderson (who also voices the bad guy of the movie, the Bowler Hat Guy). Meet the Robinsons starts in the present, where young Lewis (voiced by Jordan Fry, Charlie and the Chocolate Factory, and Daniel Hansen, Stuart Little 2, Buying the Cow) is a brainy kid that wants to be adopted. He thinks that he has a better chance with prospective parents by showing them his amazing inventions. But his inventions either backfire, or the parents want a child who likes sports. Lewis would love nothing more than a happy family, and each rejection. His latest invention, one that allows people to see their memories, backfires at the Science Fair, and leaves Wilbur in an especially dreary mood. What he doesn't know is that Bowler Hat Guy sabotaged the experiment, and is trying to steal it. Into the mix comes Wilbur Robinson (voiced by Wesley Singerman, Just for Kicks), a boy who claims to be from the future. He arrives in Lewis' time, and tries to convince him to fix the project. Wilbur claims to be from the future. Lewis doesn't believe him until he convinces Wilbur to take him there. Once in the future, Lewis is wide-eyed at everything around him. There are singing frogs, dogs with glasses, beautiful buildings, and of course, tons of really cool inventions. The story kicks into high gear, with Bowler Hat Guy's intentions slowly coming to light, and Wilbur continuously trying to hide something. Yeah, it's obvious, but not to the point where it is annoying. And Meet the Robinsons also doesn't feel like it's trying too hard to please the audience. Just mixed results overall. 1 hour, 36 minutes, Rated G.